I was supposed to make this recipe a few weeks ago, but the genius that I am – I misread the recipe. I finally got around to trying the actual recipe I intended to make and it turned out delicious! I even got a two thumbs up from the husband, it is definitely a keeper! Thank you, pinterest for another great recipe idea. The studying continues for boards part 1, so say a little extra prayer for me. Exactly 1 week from today, I’ll have just finished my exam. I cannot wait to be done. To relieve the stress I have been baking… last night I made some fabulous cake batter chocolate cookies with butterscotch chips. They turned out incredible. I’ll have to post the recipe soon. 1. Preheat oven to 350°.2. In a pan cook ground beef; add taco seasoning and prepare according to package directions. Add cream cheese, cover and simmer until cheese is melted. Blend well. Set aside. 3. 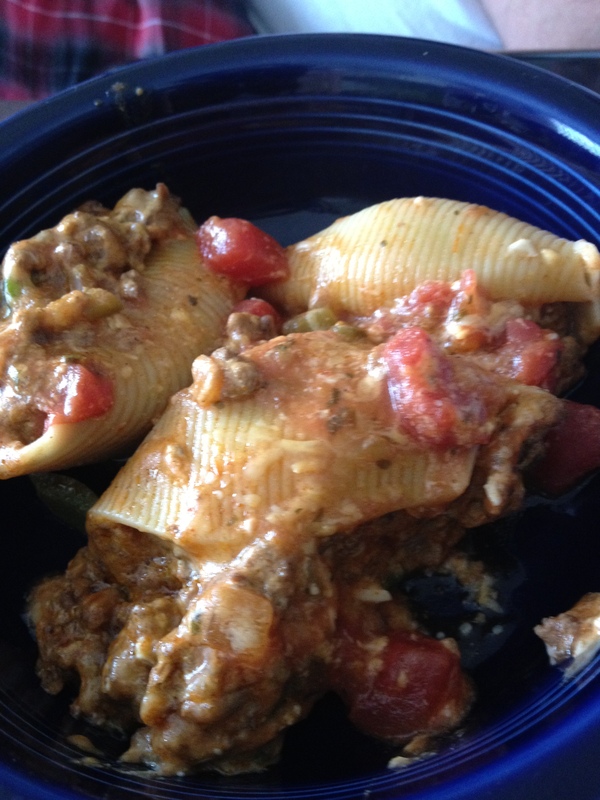 While ground beef is cooking, cook the pasta shells according to directions; drain. Set shells out individually on cutting board/baking sheet so that they don’t stick together. 4. Pour salsa on bottom of 9×13 baking dish. Stuff each shell with the meat mixture. Place shells in 9×13 pan open side up. Cover shells with taco sauce. 5. Cover with foil and bake for 20 minutes. After 15 minutes, add shredded cheese and bake for 10-15 more minutes, with the foil removed. Top with any condiments you’d like. Back to studying I go!